Oh boy, already 2.376 words I wrote about this subject and literally thousands of people are discussing it! Purpose of my today’s article is to share new information with you, correct a mistake I made and put forward some relevant questions for all of us. 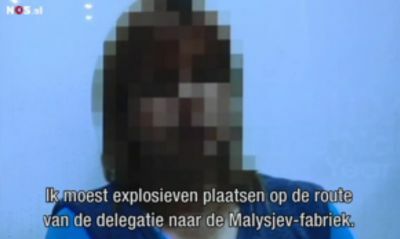 The person interviewed by Dutch journalist Koens claims to have seen a plume that might turn out to be the contrail of the BUK-M1 missile that destroyed MH17. The witness presented by the SBU (Ukrainian Secret Service) no longer lives in Torez but fled some time after the rebels took over the city. His testimony will probably allow witness to become candidate for the SBU witness protection program. Huyevo is truly a remarkable guy. With help from people which names cannot be disclosed at the moment I made following report about some of his tweets. After reading the report, just a thought: could it be, just maybe, that the anonymous witness and Huyevo are one and the same person? I’ll wait for others to comment and will write about it in another article. I laughed so loud my girlfriend asked if everything is okay with me. 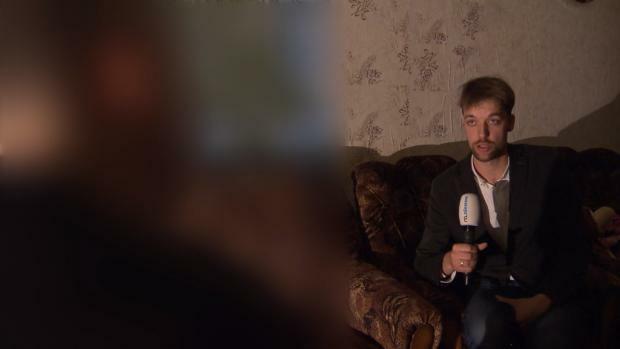 Now even the Dutch authorities and ‘Russia experts’ on TV openly had to distance themselves as can be read here. *1) Input artillery expert: the first shot in the video is not an attack missile but a ‘measurement shot’ which is fired in a steep angle. This missile does not contain a warhead, instead sensory and measurement equipment. Data from this launch is used to fine tune the targeting of the missiles with warheads. This explains the optical difference of the flight path of the first missile compared to the others. 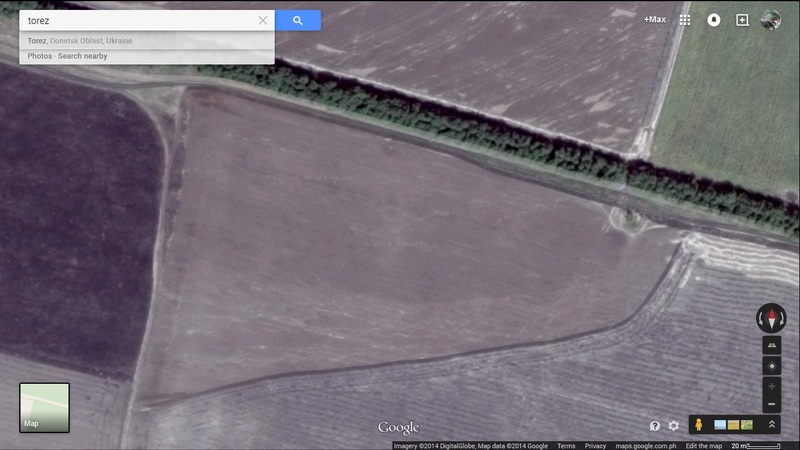 *2) Input Bellingcat: location of ‘video spot’ falsified. a) The falsification of the location of the video does not mean there was no Grad attack anywhere on the line (white) of sight. b) The area of possible firing spots of potential Grad units becomes dramatically larger. From the small circle (light green) it increases to any point between the dark green lines. c) The limited possible directions of the missiles flight path as indicated between the red lines is no longer valid. New limitation has to be established. Please consider I am a blogger and not an artist and all my drawings are meant for indication purpose only. 4) Maybe the most significant conclusion: in the Grad hypothesis the date can be any date before or exactly at July 17, 2014. Instead of simply dismissing the geolocation given by Bellingcat, I should have falsified the data first by finding the ‘real spot’ of the video. The logical fallacy however created a new hypothesis which otherwise I would have completely missed. a) BUK-M1 contrail photographed on July 17.
b) First missile of Grad barrage any time not later than July 17.
c) Strubble fire caused by agricultural activities. d) Why not keep option open for: other causes. What to expect from different eyewitnesses after BUK-M1 launch? I have looked at other locations than the flat and came to the conclusion that many people in various locations could have made quite unusual and different observations. Two locations other than the photographers location I will now discuss. The 3D-model generated this view form altitude 46,556ft. People on the ground in Pelahiivka would be able to see contrail of the Buk flying over their heads in the open parts of the sky. Could they have heard the sonic boom and exploding Buk? 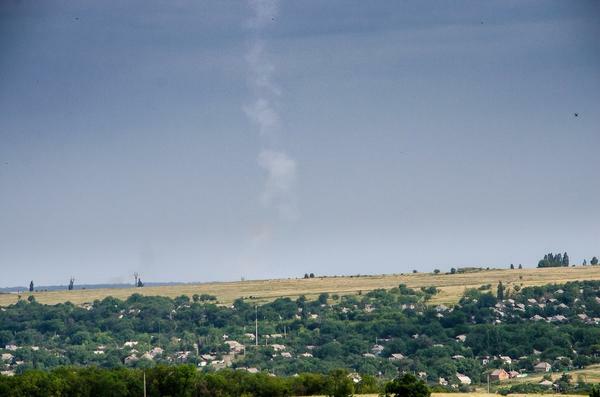 Then, not much later on the left hand site they can certainly see a huge smoke column developing after MH17 crashed. People in Sjeverne could have seen the Buk rising from their left view to the right until it disappeared in the clouds to then become visible again in the sections of possibly open sky. A few moments later they can see a black plume rising. 2) can trajectories be falsified? 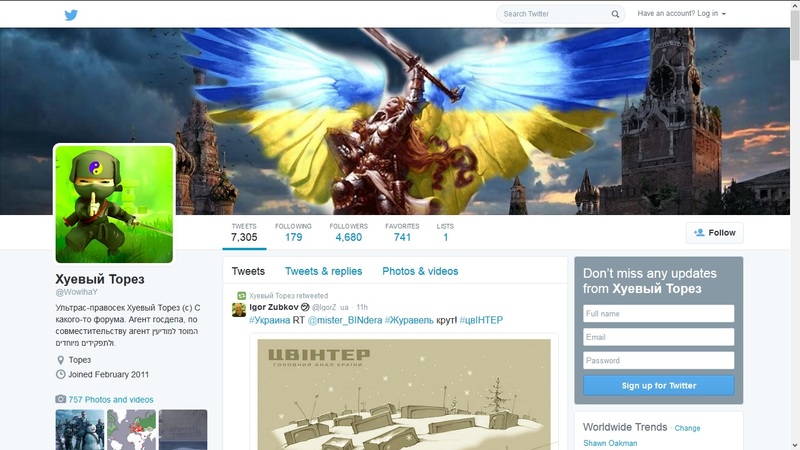 And/or Has been established it is physically possible Buk hit MH17? I read some say it is not? 3) What about question 2) for Grad? 1) “measuring shots” as described by ‘anonymous artillery expert’ exist. Important note: I have NO IDEA about which weapon was used, who fired it and who supplied it causing the MH17 tragedy. I have no idea if it was an accident, deliberate act or even a false flag. I have no idea about a possible motive. But things look increasingly bleak for the BUK-theory.